Enjoy a healthful meal on the patio of the Hôtel Plaza Athénée. 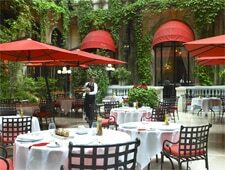 : Designers and models dine at La Cour Jardin, on the patio of the Hôtel Plaza Athénée. Alain Ducasse and Lawrence Aboucaya, owner of Pousse-Pousse, a vegetarian restaurant in Paris, have concocted a special high-energy menu. If you prize organic and healthy food, then treat yourself with the caviar of germed lentils with crackers and sliced vegetables or tomatoes served with Rove cheese. To match this vitamin-packed cuisine, the juice bar proposes cold-pressed fruit, wheatgrass and vegetable juices.